Imperial marrow! (and yes, that really is to scale). As the zucchini afficionados among you will be aware, zucchinis are not really at their best once they start getting big enough to be used as blunt instruments. They get all mealy and lose what little flavour they had to start with. There are basically two uses for them at that point – you can brandish them at people and make them giggle (this works surprisingly consistently), or you can grate them and make them into cakes, quickbreads, or muffins. 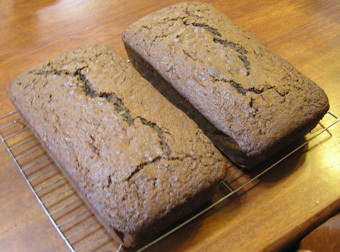 Line two large or 3 medium loaf tins with baking paper, and preheat the oven to 180°C. Beat together butter, zest and sugar with a fork until well-combined. Allegedly one should cream them, but I am far too lazy to bother. Add eggs two by two, like the animals in the ark only with less flooding, unless you are in Melbourne, in which case you are probably feeling by now that Noah might have been onto something, especially if his ark didn’t have a skylight. Once you’ve beaten in the eggs, add the zucchini, spices, cocoa and flour. Mix well, then stir in the chopped dark chocolate. Divide between your tins and bake for 45 minutes to an hour, until a skewer comes out clean when you insert it into the cake. The original recipe suggests icing the cake with orange icing, but we still have a house full of Christmas goodies, so I’m leaving it plain. Besides, this cake *obviously* deserves chocolate icing if it’s going to have any icing at all. Making this dairy free is just a matter of substituting in nuttelex for butter, especially since I completely forgot to add milk to the recipe anyway. Egg-free would be trickier, because there is a fair bit of egg here, and I think it’s holding the cake together rather. I think I’d probably use a couple of flaxseed eggs, plus 1 cup of soy yoghurt and a teaspoon or two of baking powder, but I make no promises. If you are just avoiding eggs and not dairy, I suspect dairy yoghurt would work better here. I’m not sure about making this gluten-free, but something tells me that substituting in 1-2 cups of almond meal for flour would work really well here, taste and texture-wise. Maybe use a gluten-free baking flour for the rest, remembering that if it is not self-raising, you will need to add a couple of teaspoons of baking powder per cup of plain flour? I’m pretty sure that making this cake gluten-free would also magically make it low fructose, which is a bonus. Are you anti-orangey things entirely, or is it just the context? I just shared this with someone else who’s zucchinis had gotten out of control. He seems eager to try it, a win for all! It freezes quite well, too, and everyone seems to like it.